I'm looking for improvements to the M2's stock bed cooling fan set-up, specifically for an M2 Rev. E with the V4 hot end. I've seen a lot of proposed fan duct solutions for E3D upgrades on the M2, as well as the v3b hot end, but I haven't seen very much for the V4 hot end. On top of that, the performance improvements of these ducts seem to be anecdotal, without any pre and post-upgrade pictures of quality improvement in actual prints. Some users are claiming they aren't seeing any quality improvements whatsoever, but are actually seeing cooling issues caused by back pressure produced by the duct. To any M2 owners out there who have adopted a solution they really like, what design did you end up going with? Re: What are M2 owners using for fan ducts? I've tried my hand at a few designs from simple ducts like this one to designs that try to wrap around the nozzle and I guess I'm one of the ones that never really saw that much of an improvement over the stock fan. On one of my printers I switched over to a Blower type fan seen here just becuase they are quieter and I can't break them by accidentally sticking an allen wrench through the blades. I'm waiting on MG to release the STL files for the new M3 fan design to see what that is all about but I haven't heard when that is going to happen yet. sthone wrote: I guess I'm one of the ones that never really saw that much of an improvement over the stock fan. Yeah, that's what I was afraid of. If these ducts worked as intended, my guess is you would see more before and after upgrade pics showing a print quality improvement. This seems like the most interesting option at this point; all I would need to do is print the duct and make a bracket for the fan to mount on. Are we just waiting on MG to post the STL on Github? In the mean time, I did find this fan duct, which I may try some prints with. 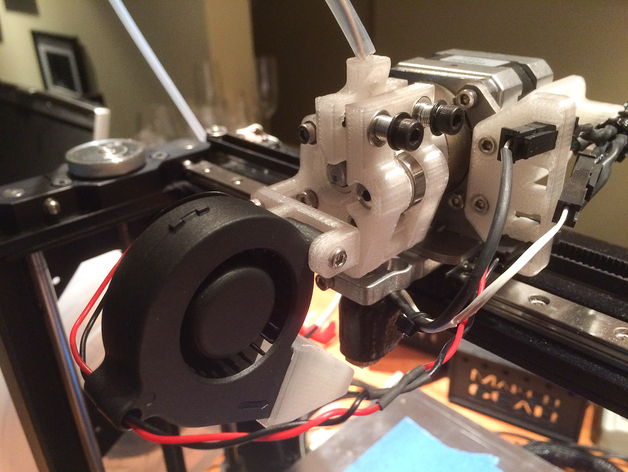 Having only used one other type of commercial printer (2016 Flashforge Creator Pro) with a blower-type cooling fan, does anyone know how the M2's stock bed cooling fan performance compares to other popular commercial machines, say for example, the Original Prusa i3 MK2S? BBID wrote: Are we just waiting on MG to post the STL on Github? Yes we are waiting for them to be posted but then again I honestly don't think anyone has asked them yet if/when they are going to post them. Keep in mind if they do post the STL a bracket will need to be designed to fit the M2 because the new fan mounts to the extended metal hotend mount of the M3." BBID wrote: In the mean time, I did find this fan duct, which I may try some prints with. That one is asctually designed to work with the V3B hotend so it might not line up with the V4 correctly. Keep in mind if they do post the STL a bracket will need to be designed to fit the M2 because the new fan mounts to the extended metal hotend mount of the M3. Not only that, but it looks like the M3 has a different fan from the M2's standard 50mm cooling fan. Do we know what the new fan's dimensions are? On a lighter note, creating a bracket for the M3's duct may allow it to be rotated out of the way when swapping the hot end, which may be a plus for M2 owners.